A VERY DIFFERENT CRUISE EXPERIENCE. No organised entertainment on board – but a daily program of lectures, briefings and themed movies. No glitzy restaurants – but chefs prepare high quality small batch cuisine using local ingredients. Do not have ‘formal’ nights or assigned seating – you can dine with whom you please. No room service menus – but the crew will be happy to serve you a meal in-room if you prefer to eat in. Do not have minibars – but guests love to mingle over drinks on the sundeck or in one of our cosy lounges. Do not have a casino – but the Captains welcome you to the bridge to observe operations and have a chat. No suites – but all cabins are ensuite with large picture windows or portholes and serviced daily. Do not charge for shore excursions. Just bring your passion to dream, explore and discover. 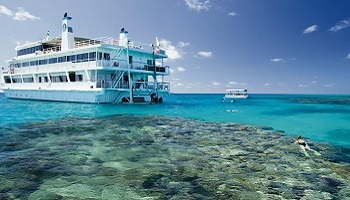 The 4-night Cairns – Lizard Island – Cairns cruise is the perfect option for those wanting to spend the maximum amount of time exploring the colourful coral gardens of the World Heritage-listed Great Barrier Reef. Enjoy a full day to discover two different sections of the rarely visited Ribbon Reefs, considered to be the most colourful and pristine reefs found anywhere along the entire length of the Great Barrier Reef, as well as the wonderful fringing reefs off Lizard Island and Two Isles. 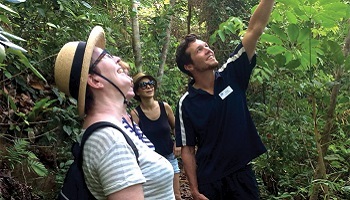 Also have the opportunity to explore historic Cooktown and savour a full morning discovering spectacular Lizard Island.